Literally, one of the best parts of Atlanta’s (and metro Atlanta’s) short spring is that we don’t have to wait for the excuse to pig out on some seriously creamy goodness. (Some of you may need a better excuse than just hot weather … that is not me.) 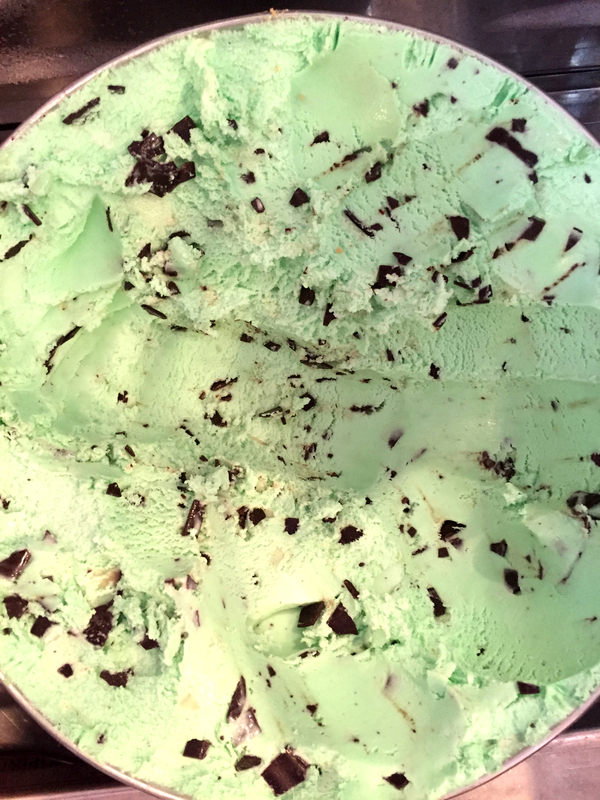 And, when you walk into a place that’s got a t-shirt made for nothing but the love of mint chocolate chip nice cream, who am I to even waver? That was the first thing I saw when I walked into Four Fat Cows – Alpharetta’s newest soda-shop-style ice cream counter. Amidst a room bursting with color not even counting the t-shirts, a rainbow of ice cream flavors awaits sweltering appetites. Right on Main Street, this little shop is run by a family of 5 (the cows are the 4 kids, who I guess aren’t taking the name seriously). What makes them different? They write their own scoop recipes. The family scrounged up taste bud memories of cones past, packed secret recipes with ingredients they wanted to serve and decided to serve it a bit below the national (I am guessing) average. They totally rocked it. I took my mom (a fellow ice cream connoisseur), threw Mac in the stroller and tasted every single thing they could put on a mini spoon. Yes, I had a killer headache afterward, but it was amazing. Amazing. The Mint Chocolate Chip was also amazing (do I sound like a Bachelor contestant or what?!). It really has so much to offer as an ice cream flavor. Who can argue with fresh breath, a green tongue and a sugar rush? Now that we’ve got the recognition out of the way, I’ll tell you that my favorite taste came as a huge surprise. The Coffee Almond Fudge was out of this world. Eldest Cow (the one wearing a Pi shirt) explained why it was so good, but I can’t even remember because I was much more concerned with finagling another sample spoon of it. There was no time though, because then came the best-selling Chocolate Overload. It was, indeed, an overload …but an overload of goodness, for sure. In fact, I guess the look on my face was so content, that said cow whipped up one of their milkshakes using it. That’s probably when I started to get light headed. The flavors never hit a bad note for me, including a dreamy Turtle (reminiscent of the – R.I.P. – “Juliette” Girl Scout cookie) and a oh-so-homemade Strawberry that I will have trouble turning down at my next visit. 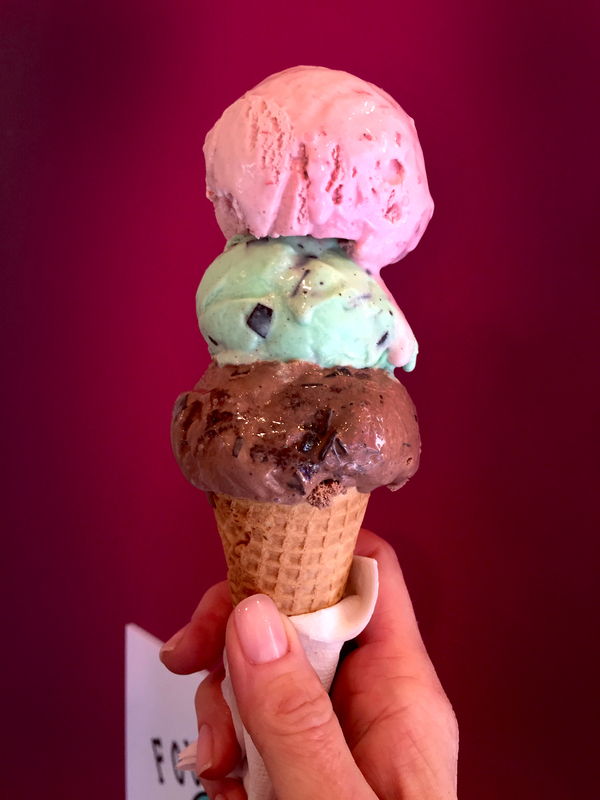 I’ll give the ice cream cows some major props because the flavors of their original recipes were better than the ones they borrowed from their creamery. It’s definitely worth mentioning that this hot (well, cool) spot serves up more than a cure for the summertime munchies. 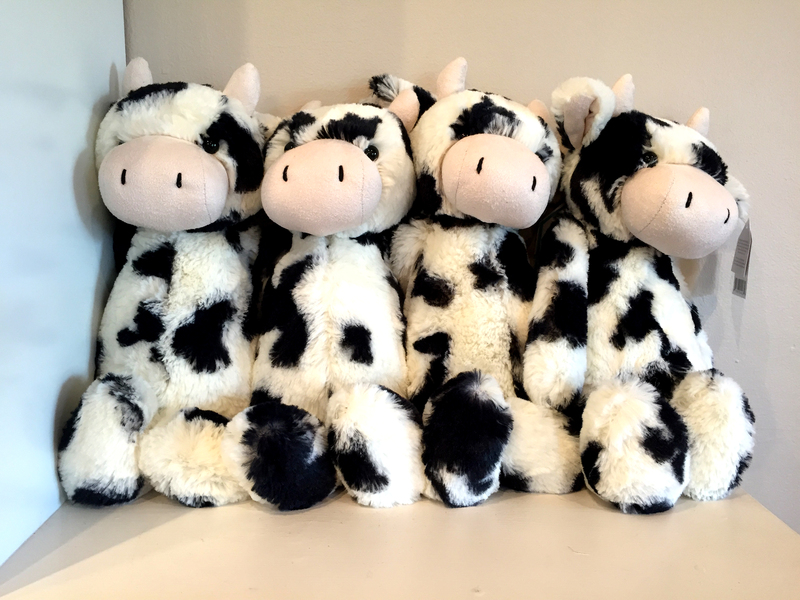 They carry a line of French-made toys that bring sophistication to your playroom. They sell a t-shirt for every kind of ice-cream lover in every color of the rainbow and they’ve stocked their shelves with local products from honey and jam to dark, dark chocolates. It’s the perfect place for kids to eat, play and then pass out in the car, so when you just have to get out of the house, it’s a destination worth dining in for.